The Santa Monica Mountains are at their least mountainous between the 101 and 405 freeways. 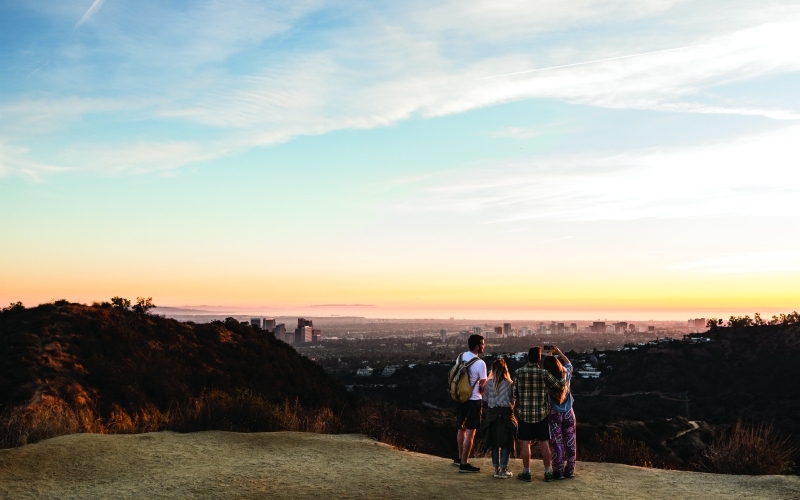 Lower in elevation and heavily developed with hillside-hugging homes, the range leaves hikers who seek a semblance of untrammeled nature in the area with few options, especially in this age of peak-Runyon. Franklin Canyon is the exception. It has an impressive Southern California pedigree: William Mulholland built the two reservoirs in the park, Claudette Colbert flashed a gam during the hitchhiking scene in It Happened One Night, and oil baron Edward L. Doheny escaped to the ranch house he owned here. The Hastain Trail begins near Doheny’s old spread along the bottomlands. To get there, take Beverly Drive from Sunset Boulevard and the Beverly Hills Hotel, pass a remnant orange grove, then wind through a tightly packed neighborhood. You emerge on a narrow road that edges the canyon’s western face, where the steep drop-off makes it easy to stay within the 15 mph speed limit. At 11 a.m. on a sunny Sunday, there are a most un-Runyonesque five cars in the lot on Lake Drive. The trail (its sign is down) begins at the far end of the grassy meadow and immediately starts climbing, passing thickets of ancient coast prickly pear and toyon thick with red berries. The vistas arrive quickly, too: out over a covered reservoir to Century City and beyond to Palos Verdes and Santa Catalina Island. In about a mile you come to a flat. The stretch up toward a commanding viewpoint enters private land but has been hiked (as in trespassed) for years. The official Hastain Trail continues to the left, dropping back into the canyon where it reaches Lake Drive. On the opposite side, look for the Discovery Trail, where you’ll crunch through sycamore leaves for less than half a mile on your way your car.